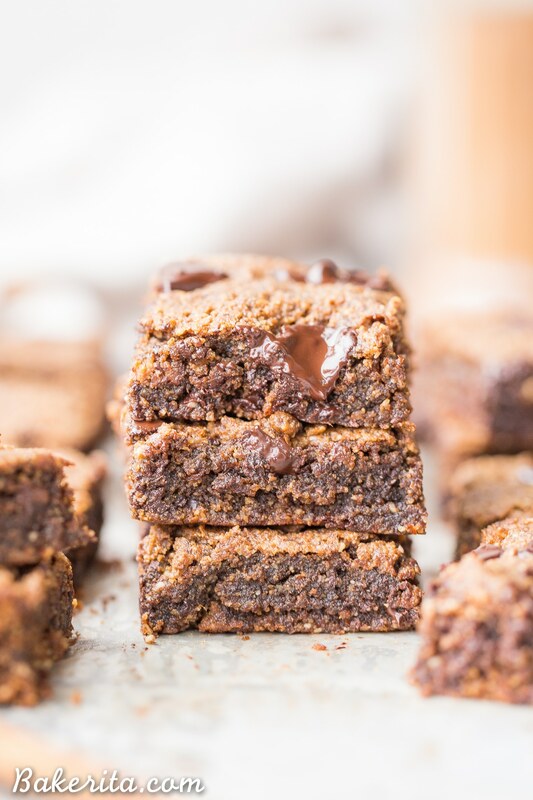 These Chocolate Chip Pumpkin Blondies have a super chewy, fudgy texture with the warmth of pumpkin spices and gooey, melted chocolate chunks. You’re going to love these gluten-free, paleo and vegan pumpkin blondies. I’ve been going pumpkin crazy…especially now that it’s officially autumn. Where in the world did the summer go? The adults were NOT kidding when they told child me that time speeds up as you get older. Anyways – pumpkin, are you a fan?! Because my kitchen is stocked with cans of organic pumpkin puree and I’ve got a number of pumpkin recipes coming for ya in the next few weeks, and many more ideas in my head, ready to be brought to delicious fruition. 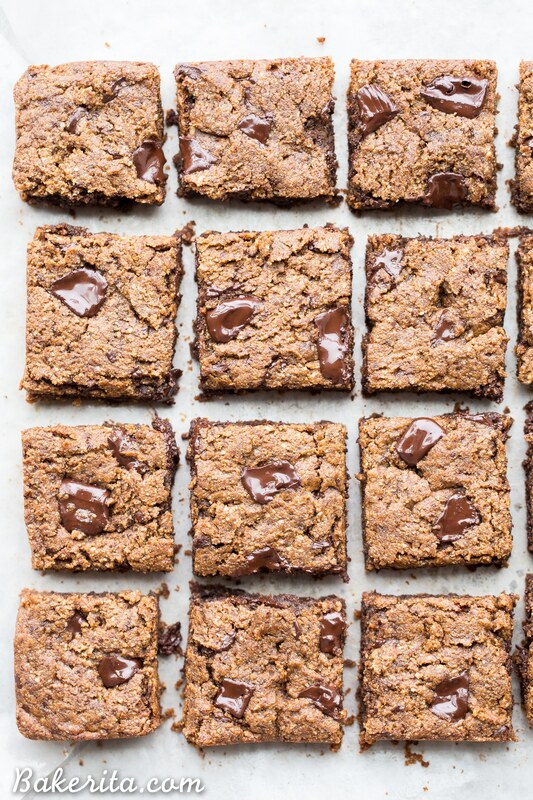 Before we get ahead of ourselves, we must discuss these pumpkin blondies. They’re gluten free, paleo, and vegan – the pumpkin serves as a perfect egg replacement here, adding moisture and chew to the blondies. These are a treat you could serve to anyone and they wouldn’t guess they’re “healthy”. 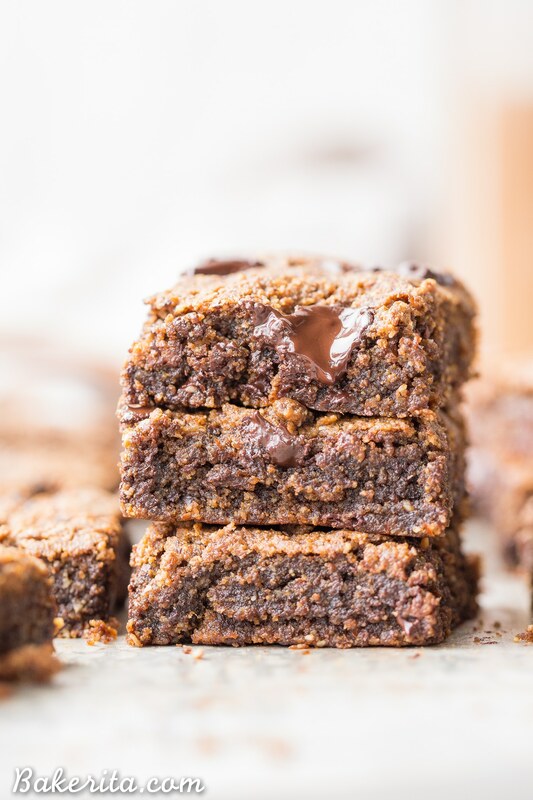 The batter has almond butter in it, and that helps make these pumpkin blondies have an incredible texture. The almond butter (or any other smooth nut butter of your choice) adds an incredible amount of chewiness and richness. The dough also uses both almond and coconut flours – the coconut flour is pretty necessary, because it helps keep the pumpkin from making the blondies too soft and moist. We don’t want them to be squishy or falling apart! Of course, we’ve got to have some spices in there too. In addition to the usual vanilla extract, cinnamon and nutmeg are also added to the dough. If you’ve got some on hand, you can use pumpkin spice in place of the cinnamon and nutmeg for a little extra somethin’ somethin’. As usual, I recommend using hand chopped, high quality chocolate instead of chocolate chips. Chocolate chips usually have waxes added to help them keep their shape, and those waxes severely inhibit chocolate gooeyness, which is what I’m always after. If you must use chocolate chips, try to use high quality ones that melt better. I hope you will give these a try – they’re one of my newest fall favorites! It’s seriously hard to beat the chew on these, and I’d be embarrassed to tell you how quickly they disappeared from my apartment  enjoy! 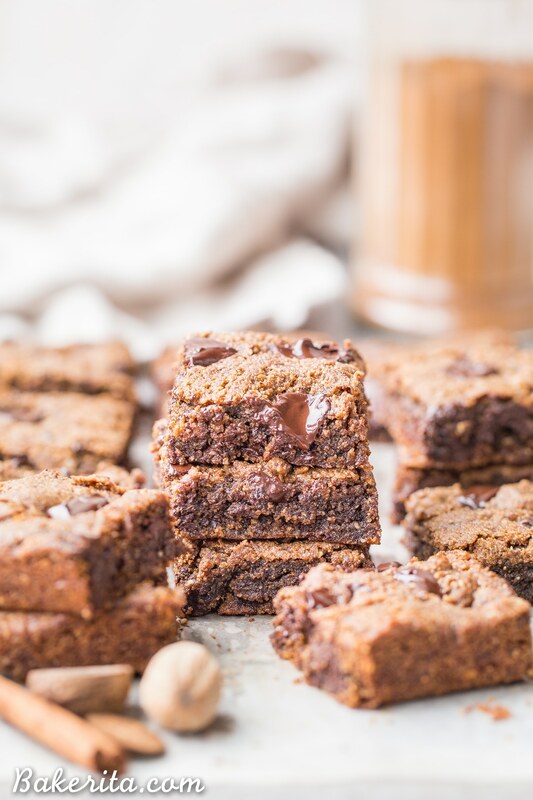 These Chocolate Chip Pumpkin Blondies have a super chewy, fudgy texture with the warmth of pumpkin spices and gooey, melted chocolate chunks. 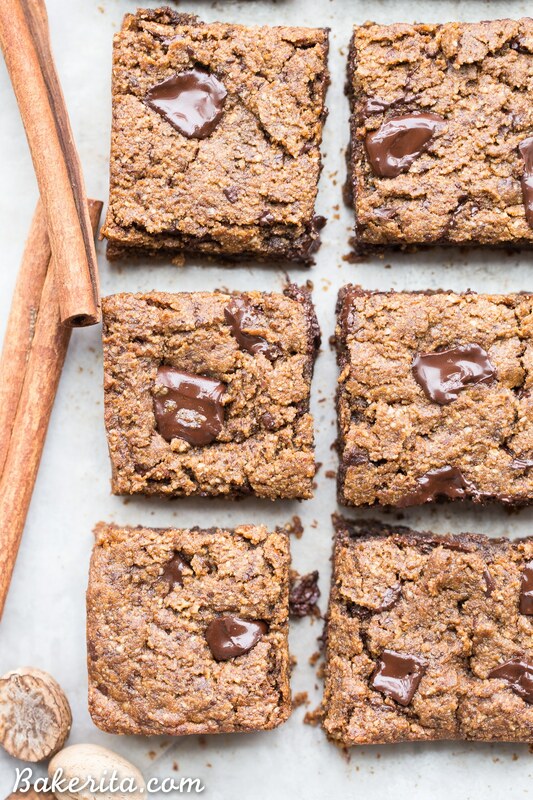 You're going to love these gluten-free, paleo and vegan pumpkin blondies. In a bowl, whisk together the almond butter, coconut oil, coconut sugar, pumpkin, and vanilla extract until smooth and combined. Stir in the almond flour, coconut flour, baking soda, cinnamon, nutmeg and salt. Fold in the chocolate chunks. Such gorgeous blondies, Rachel!! 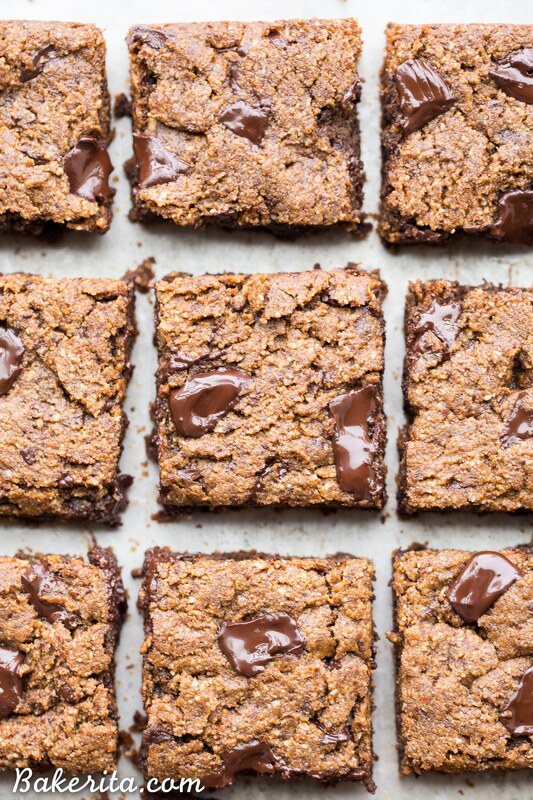 I have NEVER tried pumpkin in my blondies and I don’t even know why because these look SO insanely chewy and amazing! I want the whole batch! Thanks so much for the love, Sarah! Hi Emily, not a mistake and you’re right, you mix it with the almond flour! I’ll fix the recipe now, thanks for pointing out my error. Perfect! I made them last night and they were totally fantastic! I’m happy I made them for someone or else I would’ve eaten wayyy to many! Thanks for an awesome recipe! Another amazing recipe which I can’t wait to try! Would you be able to include the measurements in grams please? It’s a lot easier for me in the UK than cups. I hope this doesn’t cause too much work. Would it be bad to use just one type of flour? If so, which one would you recommend? You could use an extra half cup of almond flour in place of the coconut flour if you only want to use one. These look delicious! Do you think it would work to use tahini in place of the nut butter? Halloween is around the corner and would live to bake some for my friends! Georgia has chocolate intolerance -poor girl- and cannot have any. Could I skip for her sake the chocolate chunks? If so, what would be a subsitution? Many thanks, Rachel, in advance! The taste is awesome, but mine ended up more gooey than I anticipated. The top was nice and golden when I took it out of the oven. Maybe I should increase the coconut flour? Hi Julie, it’s possible you used a wetter pumpkin puree than me, or you oven temp may be running low – did you do a toothpick test to make sure they were cooked through before pulling from the oven? You should try that to make sure they’re fully cooked before pulling from the oven.